Patrick Murphy — forty-three years old, unemployed and overweight — returns to a stretch of Maine coast where he remembers a happy holiday as a boy. He doesn’t really know why he has come to this boarded-up resort town in the dead of winter, except that it has something to do with the dreams he has been having for the past year. In less stable moments, he imagines that a whale has told him to come here. Apparently it was advice he should have ignored because that afternoon he gets trapped on a sandbar by the rising tide and is swept beneath the freezing waves. Astronomer John Murphy, Patrick’s estranged brother, is also having disturbing dreams. As if sleepless nights weren’t bad enough, John’s radio telescope observations of Saturn’s moon, Titan, reveals something impossible: a signal is being beamed to Earth. Patrick survives after a dolphin carries him, unconscious, to shore. He awakens three days later with an urgent message for the world: a gigantic comet is heading for Earth. FBI agent Ted Sullo confiscates John’s Titan transmission tapes for reasons he can’t understand, and he finds himself doubting the motivations of those in charge. Awakened at precisely 3:00 every morning, his mind screaming with a recurrent nightmare in which a whale watches helplessly as a man drowns, John finds Patrick in Anchor Beach and they establish the trajectory of the comet, not yet visible from Earth. The Murphy brothers predict the location of the comet, still behind the Sun, which enables the Cassini Probe cameras to locate it. No surprise: the US government keeps everything hidden from the public. Sullo witnesses officialdom’s panic because John knows things they do not. Fear gathers with every clairvoyant prediction that proves true. It is not just John and Patrick who are being visited by prophetic dreams. John’s sons — two-year-old Frankie and twelve-year-old Eric — are having strange experiences. And another pair of estranged brothers — Himalayan-trained yogi Hal and psychologically damaged defense contractor George — have also been immersed in this oceanic mind. Human arrogance takes a nosedive with the discovery that ocean-dwellers on Titan, who have been communicating with Earth’s whales for eons, have contacted the human race only because our technology is needed to save their friends from a global threat. Since they are unable to communicate directly with the human species, who define their artifact-based orientation as the only legitimate form of intelligence, the beings of Titan are attempting to communicate with humans in two different ways. They have sent a radio transmission to Earth, in the hope that radio telescopes will pick it up. And they have provided whales with images designed to awaken the human race to a wider perspective. These images are communicated psychically to the segment of the human species with a capacity to recognize them. But more is needed. The comet, more massive than Lake Ontario, will strike Earth within three months and cannot be averted by any new understanding or captivating vision. Human technology is needed. And therefore the gigantic worms living in the Oceans of Titan have infused George Ball with a deep-space missile-control technology. Only George’s brother, Hal, understands what is happening on Earth. Aliens have contacted two sets of alienated brothers because they are attempting to forge a fraternal connection between humans and cetaceans. If bitterly estranged human siblings can reconcile, it may seed a connection between man and whale. But the Titanians don’t understand the human mind very well. They have attempted direct communication with two human beings, with very different results. They have communicated with Frankie since his birth two years ago. And they have downloaded the design for the new intruder-defense system directly into George’s mind. Frankie is at home with cetaceans and aliens. But George has been driven insane by the fluid Titanian consciousness and by images of their eel bodies which have come along with direct contact. George orders the slaughter of cetaceans congregated around Hawaii, and only Frankie can pull him out of the psychic horror into which he has been plunged. Patrick Murphy has visions of the solar system from which John is able to identify the location of the still sun-eclipsed comet. Patrick also has visions of the ice sculptures of Titan, a transient world in which no artifact can survive the ineluctable migration of time. The Titanians themselves are blind eels but have a physiological element that travels in Titan’s atmosphere and beyond. It is this part of several Titanian beings that has been sent to Earth in a desperate attempt to save their friends — the whales and dolphins. Ted Sullo also starts having visions, which soon dissolve his obedience to FBI director Todd, who he suspects has an unholy alliance with George. Sullo bugs Todd’s briefcase and discovers that George has ordered Todd to assassinate Patrick and John. The American President gives the order to launch George’s untested system, armed with a high-megaton payload. However megalomaniacal George has sabotaged ground control and the nuclear-tipped missile strikes the massive comet several weeks later. The comet is shattered and now the core, still heading for Earth, has a swarm of fragments around it. George becomes increasingly psychotic. Only Hal understands George’s connection to Frankie who, unlike George, is at home with the fluid intelligence of the ocean dwellers. Frankie teaches George to ‘swim’ in the Titan-influenced consciousness, and — recalled to relative sanity — George throws himself into the task of cleaning up the mess that is heading toward Earth at 60 miles a second. Squadrons of missiles sweep away most of the debris, but two massive fragments strike Earth, unleashing tsunamis and earthquakes. Earth awaits the possible impact of the far larger core, as understanding comes too late. Patrick with many humans and cetaceans dies in the ocean off Hawaii. John’s family flees to an underground shelter near Montreal, but when the hurricanes hit, Eric is missing. As the world falls silent, no one knows whether Earth will evade the life-annihilating core. This is a story about human indifference towards forms of life unlike our own, and how whales and dolphins have suffered as a result. SETI is looking for intelligent life in an abstract universe. In a modern day “parable of the talents”, the melting southern icecap relegates human beings to a few shrunken islands while cetaceans inherit an ocean world. In an epilogue written 17 years later by John’s son, Eric, we discover that Earth has survived. Hal assigned a desperate task to Eric, who has grown up alone in a dark, watery future. Before he died in the tsunami, Hal insisted that Eric record the events that preceded the comet strikes. Eric has finally compiled this document because Hal told him that the Titanians were capable of lifting it from his mind and sending it back to our time. A slim hope remains that the Titanians will have a motivation for doing this: For humans, whose best capacities surfaced in the last days before the fragments struck. For cetaceans, who suffered great loses and even now are in danger of extinction. And for the Titanians eels, whose organs of perception have been marooned on Earth for all of time. 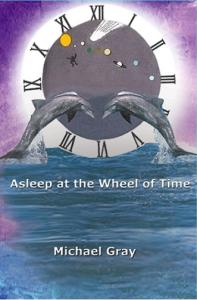 Bulk purchases can be made via emailing the author directly at michael@michaelgrayauthor.com.